Found these in the Canary Wharf Waitrose, marked as £4 on the shelf (though code wasn't same as product) scanned and bought at £4 though. May also be available in John Lewis? Congratulations! 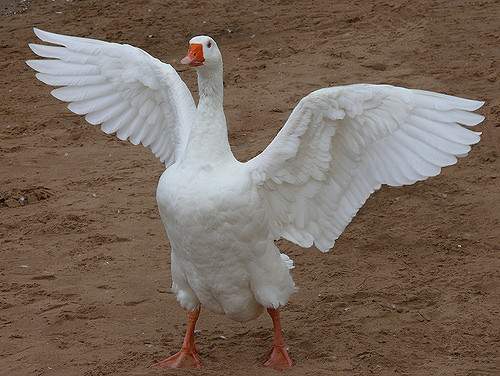 You have won the HUKD wild goose chase award for the month of November! I would add that the Canary Wharf Waitrose is really a John Lewis branch in disguise... I'm not saying that anyone will, but generally anything that isn't in the grocery section is closer aligned to JL... so if you are going to find them, likely it'll be in JL rather than Waitrose unless they were on the ground floor among the traditional Waitrose lines. 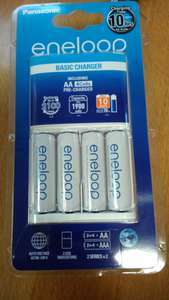 If you cant get the eneloops then IKEA sells great batteries very cheap called LADDA 2450 for AA it is a white colour and is the only good one , if you need AAA then LADDA 900 both are suspected to be eneloop pro (series 3?) I believe this to be true as I have some of both and they seem equal. there is also a brown colour batteries called LADDA with 500 AAA and 1000 AA but they are crap so do not buy them. Great price for the batteries alone, let alone the charger. Have some heat! Great price on the batteries, chuck the charger. I've been using nothing but eneloops for years for all my batteries and can't fault them. This is a fantastic price for some. I'd definitely buy a faster charger though. That said I wouldn't bin the one they come with as it'd do in a pinch. I'm not sure if this is the BQ-CC18 or BQ-CC51 charger but both are rubbish chargers with a fixed 12.5 hour charge time that'll typically overcharge batteries. If you're going to use this charger it's best to remove them manually after 6-8 hours. £4 for a 4 pack of eneloops alone is a good price though. Just checked the Waitrose over the road from me (Bromley) and they are full price in there. Anyone tried the Newcastle branch? Paid £8 for this in the Coulsdon branch last month, thought it was a bargain then! Where in store? I went in CW branch and these are still £29.99 in the electronics department. These are the best rechargable batteries. Where in store? I went in CW branch and these are still £29.99 in the …Where in store? I went in CW branch and these are still £29.99 in the electronics department. Are posh batteries as good as regular hard working class batteries? I use an Xtar VC4 but i use that mostly for 18650 batteries. I found that the ones that come with the batteries take too long and get very hot. Actually Eneloop Pros aren't better, even though the name would imply they are. They have a 30% higher capacity for AA and that is the only advantage. The normal Eneloops are better in other ways. Also, Eneloop Pros are slightly heavier. You can notice the difference when using them in devices though it depends the device itself whether the weight has a negative effect. It didn't effect me using an Xbox controller but it made a surprisingly difference having a heavier mouse when gaming. The Pros are meant for high energy consuming devices but I imagine they'll only make a difference in something like a digital camera and flash. I found that it didn't make a significant effect on my controller or mouse use time. If using it for home especially, I recommended getting the normal, cheaper ones and buying more of them so you always have spares. Would be scorching hot if available more widely... unfortunately, it seems like a one-off. £4 off (so £12.99) in Northwich Waitrose. Actually Eneloop Pros aren't better, even though the name would imply they …Actually Eneloop Pros aren't better, even though the name would imply they are. They have a 30% higher capacity for AA and that is the only advantage. The normal Eneloops are better in other ways.Normal/Pro differences According to website...Recharge 2100 vs 500 timesCapacity at 70%, 10 years vs 85%, 1 yearAlso, Eneloop Pros are slightly heavier. You can notice the difference when using them in devices though it depends the device itself whether the weight has a negative effect. It didn't effect me using an Xbox controller but it made a surprisingly difference having a heavier mouse when gaming.The Pros are meant for high energy consuming devices but I imagine they'll only make a difference in something like a digital camera and flash. I found that it didn't make a significant effect on my controller or mouse use time.If using it for home especially, I recommended getting the normal, cheaper ones and buying more of them so you always have spares. Hi I use IKEA LADDA 2450 and eneloop 1900 and pro 2450 I find they work well in my mouse which is laser wireless and depletes a battery every 2 days, but the cost of eneloops is pretty high so now since I discovered the IKEA LADDA rechargeable I always get as they are very affordable with near identical performance. So errr no one other than the op has managed to find them anywhere at this price? If you cant get the eneloops then IKEA sells great batteries very cheap …If you cant get the eneloops then IKEA sells great batteries very cheap called LADDA 2450 for AA it is a white colour and is the only good one , if you need AAA then LADDA 900 both are suspected to be eneloop pro (series 3?) I believe this to be true as I have some of both and they seem equal. if you want a good charger the only good one they sell is also the LADDA named one which has 4 slots for AA or AAA it is very good charger for sure but has one caveat which is that it runs too hot which would reduce battery durability over time but my workaround was to place it on the exhaust vent of my vax air purifier which keeps it very cool,IKEA LADDA AA 2450 battery review - £5.50 for fourIKEA LADDA AAA 900 battery review - £4.00 for fourIKEA LADDA charger review - £10.00a couple of side notes:the other two chargers they have are crap,there is also a brown colour batteries called LADDA with 500 AAA and 1000 AA but they are crap so do not buy them. Is that charger doing 1A per battery? Seems a dumb-intelligent charger, but a charger that requires cooling is not something I'd be keen on. The 7dayshop one defaults to charging at 200mA which is better for battery health. It can also do 500mA, 700mA and 1A, but the IKEA is limited to 1A which is insane. Who always charges their batteries at 1A? I wouldn't recommend the IKEA on those grounds alone! They both run hot but the 7dayshop is capable of running cooler - it will do in the normal charging modes of 200mA or 500mA. Plus it has capacity test/discharge/refresh, and information like voltage on the display, and individual monitoring of each battery charge, whereas the IKEA one will only tell you when they are all charged! And the plots of the 7dayshop you linked to look good and clean. But mainly, 1A charging only.. no thanks..! best aku !! H O T !!! £15.50 in Sanderstead so store specific.